Animal Welfare advocates have criticized dissection in schools and have pushed for alternatives for decades. Two groups—the Animal Welfare Institute and Save the Frogs—have put their money where their mouths are and recently offered up free anatomy software to schools that agree to give up dissection. Rancho Verde High School in Southern California agreed to become the first U.S. school to take the offer. The animal welfare group will be giving Digital Frog 2.5 software licenses, worth $900 each, to the first 25 schools that agree to give up dissections for five years. “It’s arguably not the same as doing it with a real animal,” said Rancho Verde assistant principal Kevin Stipp, who taught science from 1986 to 2000. Without the hands-on component, a computer dissection can’t be as realistic, he said, “But it’s not so drastically different that the kids won’t get something out of it.” Proponents of virtual dissection programs say they are more humane and safer than using real animals. Today, students, educators, and parents are concerned not only about the death of innocent animals when it comes to dissection but also the pain that these animals must go through before they even reach the classroom. Animal welfare groups claim that many animals are raised specifically for dissection, while others are purchased from fur farms and factory farms, supporting two horrific industries. Opponents of dissection claim that many of the animals used in experiments are collected by people called “bunchers,” who answer free-to-a-good-home ads and pick up stray cats and people’s pets who have gotten lost. Frogs are the most commonly used animals in dissection. Those opposed to dissection have argued that not only is it inhumane to experiment on animals in schools, but dissection also destroys the environment. Animal advocates claim that the removal of frogs from ecosystems disrupts nature’s delicate balance, resulting in increased crop destruction, pesticide use, and spread of disease. It has also been argued that dissecting animals in the classroom desensitizes kids to the sanctity of life. Research has shown that a large percentage of students are uneasy about using animals in experiments. Animal welfare advocates argue that exposing kids to dissection fosters callousness toward animals and nature. Lucky for those opposed to dissection, it’s becoming easier to choose not to dissect. According to animal welfare advocates, if you live in California, Florida, Illinois, Louisiana, Maine, Maryland, Massachusetts, New Jersey, New Mexico, New York, Oregon, Pennsylvania, Rhode Island, Vermont, or Virginia, you have the option, by law, to choose not to dissect. The more students who voice their opinion and opt out of dissection, the greater the chances the school will stop supporting the destruction of life in the name of education. It is my belief that it’s not ethical to dissect animals so that students can learn about anatomy. When I was in both middle school and high school, I took a stand and refused to dissect. Regardless of whether these animals were bred for dissection or taken from their natural habitat, they deserve to live their lives free from exploitation. Given today’s computer technology, virtual dissection can be an adequate learning tool without the cruelty. Make sure to tell your kids they have a choice not to participate in the dissection of innocent animals. * Health evaluation, including testing for feline leukemia (FeLV) and feline immunodeficiency virus (FIV). Cats thought to be 10 years or older receive a full blood panel evaluation, thus assuring that the cat is indeed healthy and adoptable. Santa Barbara Humane Society offers discount on cat adoptions. To adopt a cat, visit the Santa Barbara Humane Society at 5399 Overpass Rd. For more information, call: 964-4777. Shelter hours are Monday-Saturday, 10 a.m-5 p.m.
Eliza and Harrison are beautiful rabbits who are siblings, and came into the shelter in 2010. They are very small, about 5 pounds each. For someone looking for a compact rabbit, these are the bunnies for you. 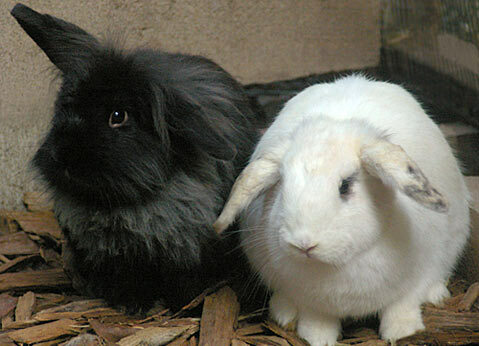 Bunnies Urgently Needing Shelter (BUNS) is a volunteer organization that cares for abandoned rabbits. BUNS is located at the Santa Barbara County Animal Shelter, 5473 Overpass Road. BUNS works to find bunnies permanent homes and educates the public on caring for a companion rabbit. You can call the County Shelter at 681-5285 or call BUNS at 683-0521 and leave a message for someone to call you back.